Credit score plays a very vital role in everyone’s financial life. For all who are not aware of credit score concept – this is a score provided by credit bureaus based of the financial track record of an individual. India has 4 credit bureaus with CIBIL (Credit Information Bureau Limited) being the oldest and with highest coverage. CIBIL score varies from 300 to 900 – the higher the score the better it is. This score indicates your creditworthiness for a future loan that you borrow. CIBIL Score is one of the major factors which decide if you can get loan and if yes how much. CIBIL score of 750 or more would make you eligible for most loans across financial institutions. However a lower score might make your loan more expensive or reduce your loan eligibility or in extreme case may also make you ineligible for any loan. The good thing is you can improve on this score. But before that lets understand why some people have poor credit score. 1. Missing repayments/EMIs or Credit card payment – This is a major contributor to your credit score. So if you have missed your EMI payments in the past, it would have a negative impact. If you miss some consecutive EMIs or do so frequently, it will have more adverse impact on your score. This indicates two things either you face cash crunch often or are habitual defaulter – which means a risky borrower! 2. High Utilization ratio on credit cards – Utilization ratio is ratio of your credit card balance to your credit limit on credit card. A higher utilization ratio is taken as negative by creditors. In case you go overboard and spend more than your available credit limit, this would make even more negative impact on your credit score. 3. Higher proportion of Unsecured Loans – Secured loans is one which is backed by assets like Home Loan, Car Loan etc. Loans like personal loans, credit cards are unsecured loans as you do not mortgage anything against these loans. A higher proportion of unsecured loan can hurt your score. 4. Looking for too many Loans too soon – Every time you apply for loan, the bank or financial institution makes an inquiry about your credit score from credit bureau. In case you have applied for multiple loans in very short time, it leads to the creditors thinking you as “Credit Hungary” i.e. person who is looking for a lot of loans in short time. 1. Check credit report for any errors – Errors are not unheard of in credit report. The first step should be to order your credit report, scan for any loans that you might not have taken or scan for errors where your lenders have wrongly reported about your loan status. You might have paid regularly but you might find some lender showing skipped payment and so on. Get it corrected and for that you’ll need to approach your lending institution and CIBIL. 2. Be regular with your EMIs and Credit card payments – As stated earlier regular payment history on loans is most important contributor to your credit score, so a regular payment helps improve your score. So from now on make sure you do not miss a single payment. You might want to use auto-debit facilities provided by banks to pay bills and EMIs. Also Read: Should you take Home Loan from Banks or HFCs (SBI Vs HDFC)? 3. Keep your credit card utilization low – It helps to spend much lower than your available credit limit on credit cards. Keep your utilization low and do not ever cross your credit limit on your credit card. In case you are high spender, you can also apply to increase the credit limit of your card. Another work around is pay as you spend – as this would keep the utilization lower. 4. Do not cancel your Credit Cards – Many advice to cancel your credit cards to improve the score. But this is not true – its good idea to keep the credit card as it adds up to the total credit limit and your spending on credit card has low utilization ratio overall – showing you are financially secure. This advice is not applicable if you have more than 3 cards. You must cancel the extras. 5. Prepay Personal Loans or outstanding credit card balance – In case you have personal loans or outstanding credit card balance, closing them might help as they are unsecured loans and also expensive. 6. Limit inquires for Loans/Credit Cards – You might be tempted to apply for every new credit card launched. But it can have negative impact on your score. Only apply for loans/credit card when you require and in that too limit your applications to few reputed lenders. 7. Monitor your joint and/or guaranteed loans – Have you taken joint loans, a default in EMI would have negative impact on all the borrowers. The case is same for loans where you are guarantor. As a guarantor you have legally agreed to pay in case the original borrower defaults. So always keep checking on loans which you have jointly or where you stand guarantor. 8. Get fixed deposit backed credit card – if you have poor score you might not be able to get regular credit card. But you can apply for credit cards backed by fixed deposits. This can help you show your regular repayments and hence improve credit history. 9. Never pay credit Repair Company – If someone claims that they can instantly improve your credit score – its not possible until its related to rectification of error! So in most cases it does not help to engage a credit repair company. However, you can contact debt counselling centers in case you are in over-debt scenario. Also as your duration of credit history increases it impacts the credit score positively. So it makes sense to get a credit card early and use it carefully to build a good credit score. It will help when you actually want to borrow for big purchases like home or car. How Long Does It Take to Rebuild CIBIL Score? 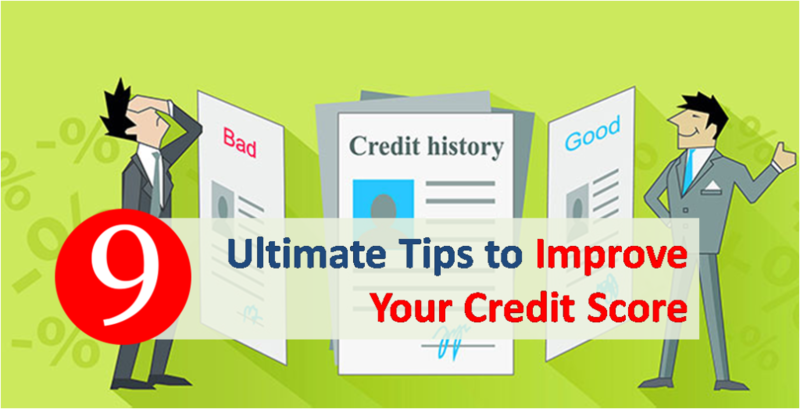 Actually you do not improve your credit score but rebuild your credit history, which is reflected as score. So the time taken depends on the reason for low score. A missed payment would have little impact but continuous missed payments would have severe negative impact and so the time taken to improve the score would also be also more. In most cases the delinquencies remain on your credit report for seven years. Ultimately, there is no quick fix and it takes Time to Improve Credit Scores – so have patience, improve your financial habit and the score improves automatically. It’s important to know that credit score is just one criteria among many used by lending intuitions to evaluate borrowers. So in case your loan is rejected by one banks does not mean no one else would give you loan. Popular banks are generally more risk averse while smaller NBFCs take more risk. So you can try smaller NBFCs if you do not find success at banks. You might also face loan rejection as you might be too new to credit. This means you applied for loan for the first time and so bureau have no credit history for you. So it’s helpful to get a credit card and use it judiciously early in working life. How good is Credit card against Fixed Deposit? I like to add one more point keeping unused credit accounts open, add to your available credit and leaving them open keeps your used credit amount on the lower side. This brings your credit utilization ratio down. I hear my CIBIL score goes down (or stays low) if I pre-pay my loan (car-loan, home-loan, etc.)! Is it true? Not really. If you have no defaults in payment your CIBIL score would be high. Pre closure of loans in most cases would be positive. Your credit score depends on timely payments of loans and credit card bills. If you pre-close your loan your credit score won’t be going down. As there is no credit rating for your accounts it would be constant.